Of all the traditional items that represent the country that you can buy in Bolivia, ponchos and hats are the classics. But because of the multicultural nature of this country, there is a great variety of traditional products. Rather than being a nation, this Latin American country where 37 official languages are spoken, is more like a group of nations. That is how it is recognized in its Constitution, by integrating the original indigenous nations as proper entities. This characteristic makes Bolivia a very culturally-rich country, and this extends to its traditional products. Traditional Bolivian ponchos are perfect for keeping you warm in cold places, such as the Andes. Most of these are made from alpaca wool, which is the native animal of this country. The ponchos are of high quality, and therefore they make the perfect gift to take back home. Many travelers choose textiles from Bolivia as their preferred souvenirs. Brightly-colored textiles are used for the traditional costumes for both men and women. Shoes, handbags, hats and an endless amount of accessories are also manufactured. You can buy these attractive textiles in the markets by weight and by the meter. Continuing with the textiles theme, the aguayos are traditional Bolivian cloaks. These cloaks are made by Bolivian women artisans and the textiles are used both as bags in which to carry goods as well as to carry their babies. Of all the Bolivian souvenirs, this is an attractive example of artisan work which can be used in a number of ways. Among all the traditional Bolivian products, the hats worn by the women are particularly special. These bowler-shaped hats are not only attractive, but they provide information about the marital status of the wearer. You can find them in many markets and street stalls, and they come in different designs and sizes. 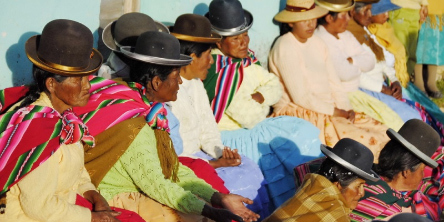 These colored woolen hats are as Peruvian as they are Bolivian, and they are known almost everywhere. Surely an attractive chullo is the perfect travel souvenir from a country that is so multicultural and alive. Alpaca wool is used to manufacture not only clothing, but also tapestries, rugs, dolls, keyrings, and a whole range of souvenirs. In general, if you barter, you will get very good prices, particularly for good quality alpaca clothing. One of the quintessential traditional products to buy in Bolivia is the stone carved talisman. These can depict anything from totems to animal figures, as well as strange faces of ancestral gods. Bolivian talismans are the perfect souvenir of Bolivia to bring good luck to your friends and family. If you visit the Salt Mines at Uyuni, you can’t leave without buying a souvenir made from salt. On the market stalls, you will find numerous objects made with this mineral. You also have rock salt for cooking, which is something different to buy in Bolivia and something that will surprise cookery aficionados. You will find the country’s traditional pottery in all the markets. There are jugs, pots, containers, etc. painted with exquisite designs or simpler ones in the original clay color. Whichever you decide on, you have lots of objects that you can buy in Bolivia if you want to take a ceramic souvenir from the country back home with you. Ametrine is also known as Bolivianite Stone and is a mixture of amethyst and citrine. You can only find this natural treasure in Bolivia, so if you are looking for a special gift as a souvenir of the journey, this gem is the answer. What better treasure to buy than a gemstone that is unique to Bolivia. With this souvenir of your journey, you will never forget the uniqueness of the country. An extravagance that you can indulge in during your trip to Bolivia is getting a tailor to make you a made-to-measure jacket. Bolivians work extremely well with this material, so you will have a stupendous leather jacket for a good price. Of all the things to buy in Bolivia, you probably haven’t thought about an ointment for your health. Well, Mentis is one of the most popular souvenirs among travelers, as it relieves coughs, muscular pains and animal and insect bites. It is made with a base of menthol, pine, and eucalyptus and is a bit reminiscent of the famous Chinese Tiger Balm. To finish, the Supay is one of those traditional Bolivian products that you can only find in this country. It is an unusual alcoholic beverage due to its spicy aniseed flavor. You will recognize it by its label, which is decorated with the face of Supay, the god of death. That should give you an indication of the strength of this Bolivian liquor. 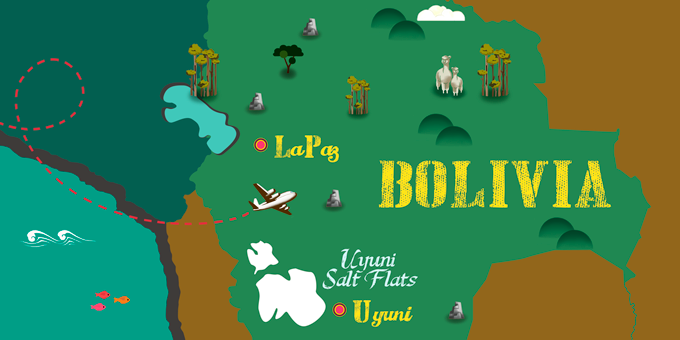 Bolivia offers you a whole world of experiences, colors, and the most original items. Don’t miss the opportunity. Make sure you leave some space in your rucksack to take a little bit of this fascinating Latin American country back home with you.